I'm beginning to figure out why I have such a hard time starting things. My problem is that I get overwhelmed by my own inability to fully grasp the intricacies of a topic or a task, and give up before I start. Voting. Eating in a way that honors God's creation. Switching to natural health and cleaning products. Making medical decisions. Arts and crafts. If I can't dive in with a high sense of informed competency at the beginning, I don't even want to test the waters. I started getting more adventurous when I was pregnant with Rosie and began sewing. I tried things even when I wasn't sure they would work. I made things up, and worked without a pattern. I allowed myself to see failure as an acceptable outcome. I let myself play at things instead of perfect them. I've tried to adopt that attitude in other areas of my life, too. For example, even though I haven't mastered the facts on fish (which have high mercury levels, which to buy farmed, which to buy wild, which are in danger from overfishing, etc. ), I try to absorb a little bit of knowledge at a time, and if I can't always be sure I'm making a responsible decision, I just make one anyway. Give myself some grace on it. This is the approach I'm taking to composting this spring. I've skimmed the book I got for Christmas, and i have realized there are a thousand different methods and a million things to know. 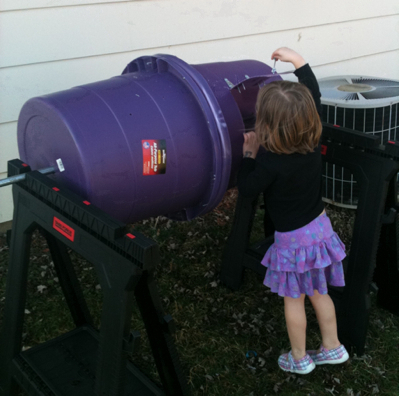 My options are deeply limited right now, since we will likely move mid-summer, so I'm just going to play at composting and see what happens. 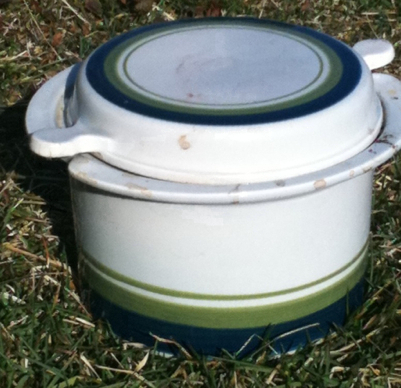 So this is the ceramic crock I got at the Goodwill and keep by my sink for kitchen scraps. 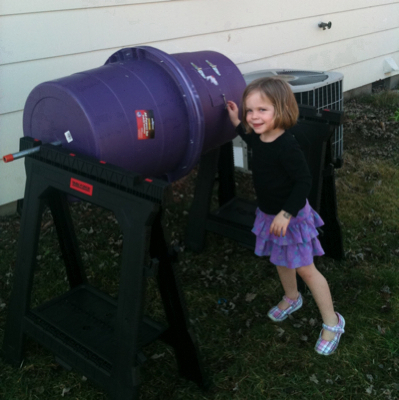 And this is the compost tumbler that my clever husband built for me. (Inspiration here.). 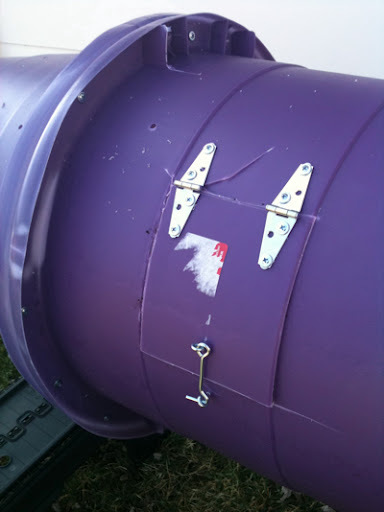 He bolted two plastic tubs together, drilled holes in the ends, and ran a steel pipe through it. Then he cut a door flap, hinged it, and added a hook and latch closure. He drilled another half dozen holes for air flow, too. When I have a full pot of kitchen compost, I drop it through the door along with a couple handfuls of dead leaves or twigs. Every now and then, I spin the bin to mix the contents. I don't know if the proportions of materials I'm adding will be right. I don't know if the moisture level is exactly where it should be. I don't know how long this cold (not hot and not worm) method of compost will take. I don't know if the bin will get too heavy to move to our next home. But that's ok. I'm just playing. I'm just giving it a try. Why did it take me so long to get here? In "food", "garden", "made from scratch", "new years resolutions", "thoughts"